HADJ TAIEB A1. MSAHLI S1. SAKLY F1. Photovoltaic cells offer significant perspectives for e-textiles applications. This paper discusses some design considerations associated with Photovoltaic cells in the textile domain by taking also into account the consumer need. Certainly, we are more and more sensitive to the ecology, but the tendency is not less important to the comfort and to our well being. A good management of the energy consumption and the use of the renewable energy such us the solar energy for textile applications are some solutions to conserve our ecology and to give some idea for the textile design for more functional textile applications to bring more comfort and well being in our live. We are going in this survey to bring some new functionality to a classic shirt by integrating electronic components to facilitate our daily by emitting light and improving thus the user's visibility for more comfort and functionality and by carrying ecological message. .
HARBAOUI M.1. OUASKER M.2. BENHASSEN M.3. BEN KAHLA N.4. MOUNANGA P.1. KHELIDJ A.1. 1Université LUNAM, Université de Nantes – IUT Saint-Nazaire, GeM, CNRS UMR 6183, Institut de Recherche en Génie Civil et Mécaniques, France. 2Centre de Recherche sur la Matière Divisée (CRMD. UMR CNRS 6619, 1b rue de la Férollerie, 45100 Orléans, France. In the present scientific work, we propose to use Alfa waste (Stipa Tenacissima) as a vegetable aggregates in the aim to design an ecology lightweight concrete with improved thermal properties. This building lightweight composite is a mix of lime as a binding agent, Alfa-waste as renewable lignocellulosic raw material and water. Four types of Alfa-lime concrete was formulated according the ratio Alfa to binder (by mass) which are: 0%, 5%, 20% and 20%. Mechanical and the thermal properties of ALC concrete were determined. Thermal conductivity tests were achieved by means of the transient Hot-Wire method. Results show that Alfa-lime concrete has a low bulk densities ranging from 833 to 950 kg/m3 and a notable thermal performance ranging, respectively, from 0.180 to 0.220 W/m.Â°C. However, mechanical results exhibit a low compressive strength ranged between 1.5 and 3.5 MPa, which indicates that ALC concrete can, at the present, be used in combination with load-bearing structure. .
ABID K.1. DHOUIB S.1. SAKLY F.1. 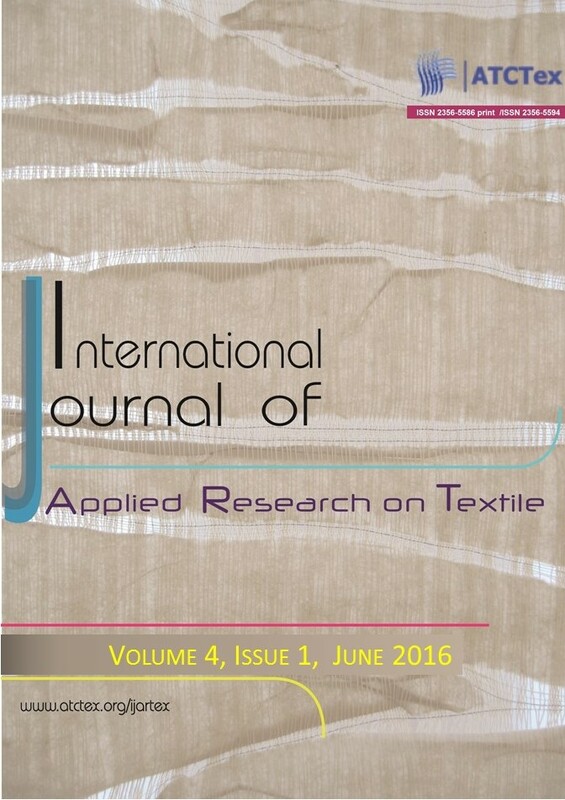 In this paper, the dielectric properties of coated fabric by nanocomposites have been studied. In fact, a resin/clay mixture was deposited on a 100 % cotton fabric and tested using a dielectric impedance spectrometer device for measuring the dielectric permittivity. The enhancement of fabric dielectric properties was noticed by calculating the complex permittivity. It has been concluded that the increasing quantities of clay and resin, decrease significantly the dielectric permittivity of a 400 g/m2 sergey fabric 100% cotton. Moreover it has been noted that the Havriliak and NÃ©gami model could be applied for these hybrid fabrics for a precise frequency spectrum. The mathematical equation has proved to be effective in predicting the fabric dielectric permittivity, by calculation the constants referred to this model. The result of theses computations indicates that clay application in nanocomposites proved its importance because the dielectric properties of the fabric are really enhanced according to the clay percentage in the coating by maximising the loss of Îµâ€™â€™. .
MALEK S.1. JAOUACHI B.1. KHEDER F.1. BEN SAID S.1. CHEIKHROUHOU M.1. This paper reports an experimental investigation into the effect of fabric and sewing parameters on the seam slippage. In this work, different parameters such as sewing thread, stitch density and fabric are studied to determine their performance according to the seamâ€™s appearance after sewing. The seam puckering has been calculated by measuring the thickness of both, the fabric and the seam, under a load of 2kPa. It has been observed that the seam puckering decreases with the increase of stitch density and it increases with the decrease of the fabric mass. It was also concluded that, for the high linear density, the polyester sewing thread increases the seam pucker rather than the cotton sewing thread for both warp and weft direction. The result is reversed for the low linear density. Various other factors influencing the seam puckering are also discussed and investigated. .
JEBALI N.1. BABAY DHOUIB A.1. BEN HASSEN M.1. The aim of this research is to select a suitable form of regression model and predict the seam quality of woven cotton fabric. Firstly, the effects of seam parameters on the seam quality are investigated while using the principal effects graphs and analysis of variance (ANOVA). The results have shown that seam efficiency was mainly influenced by sewing thread and stitch density. Moreover, stitch density and stitch type have the most significant effect on seam slippage and pucker. In second stage, we were interested to identify the suitable sewing conditions in order to achieve a good seam quality using a new term called a total seam quality index (TSQI) which takes account of all the seam quality parameters analysis. Finally, In order to evaluate the effect of the influencing factors, statistical models based on multiple linear regressions were developed using the experimental results of Taguchi design to predict the overall seam quality. Very good results were obtained with high correlation coefficient values. .
BOUCHRAIET R.1. AZZOUZ B.1. BEN HASSEN M.1. SAKLY F.1. In view of their physical properties and ultimate textile products quality, natural fibers have attracted attention to research workers and textiles experts. The modeling of blended fibers proportions of cotton-flax yarns produced on ring and rotor spinning machines are developed in the present study. Using experimental design method, the effect of blend proportions, setting parameters and spinning processes on physical properties of yarns are revealed and related. It was fund that the quality index of cotton flax blended yarn is largely influenced by the blended ratio of raw materials. However, three influencing factors, the metric yarn count, the twist coefficient value and the type of spinning system used are considered to be very critical to determinate the resistance and the elongation of the final blended yarns..